The Big Ten Conference’s two highest-scoring teams meet in an 8 p.m. Thursday game that could alter the league title race. The Iowa senior speaks before Thursday's showdown at Indiana. BLOOMINGTON, Ind. — First one to 90 wins? Sure, you can expect a lot of points Thursday night inside Assembly Hall, as the Big Ten Conference’s two highest-scoring teams meet in an 8 p.m. game that could alter the league title race. But as far as fifth-ranked Iowa is concerned, this one will be won when Indiana — the nation’s second-best shooting team at 51.1 percent — has the basketball in its hand. This one’s a biggie for the Hawkeyes (19-4, 10-1 Big Ten), who can either fall into a first-place tie with Maryland (22-3, 10-2) and Indiana (19-5, 9-2) or take another big step forward in their quest for the first regular-season conference title in 37 years. So far, “surgical” best describes Iowa’s march through the Big Ten schedule. Nine of the 10 wins have come by double figures, including three on the road (Michigan State, Rutgers, Illinois). Like a doctor who comes thoroughly prepared for an operation, the Hawkeyes take a meticulous approach to every game. They spent practices Tuesday and Wednesday soaking up the gameplan from assistant coach Kirk Speraw, who annually gets the Indiana scout. Last year, Iowa followed the Speraw script and pounded the Hoosiers 77-63 in Bloomington. The Hawkeyes held star guard Yogi Ferrell to 3-for-11 shooting in that one. 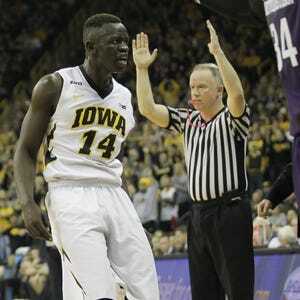 “We came ready to play last year,” Jok said. “We shut down the main guy we needed to shut down to win." Having a veteran group helps. How each player processes information from assistants Speraw, Sherman Dillard and Andrew Francis, though, varies. “Truthfully, I try to only take in what I use on the court,” senior forward Jarrod Uthoff said. “I take in personnel. I know people, I know what their tendencies are. I know how to defend them. It almost sounds robotic, but maybe that's why it's been so effective. The stakes are getting bigger for the fifth-ranked Iowa Hawkeyes. Iowa plays Indiana on Thursday in a showdown of the top teams in the Big Ten. The Hawkeyes, despite scoring 80.7 points a game, boast the 11th-most efficient defense in the country, allowing .923 points per possession according to Ken Pomeroy's rankings. That number will be put to the test against an Indiana team that is third nationally on 2-point attempts (57.0 percent) and fourth from 3-point range (42.2 percent). Ferrell is the engine that makes Indiana go. The 6-foot senior is averaging 17.3 points and 5.8 assists a game, both ranking fourth in the Big Ten. Gesell and Anthony Clemmons will likely get their shots at guarding him, but don’t be surprised to see Iowa play zone, too. McCaffery has been masterful at mixing up defenses all season. Indiana’s top five scorers shoot at least 47 percent from the field, though the loss of James Blackmon Jr. (15.8 ppg) to a season-ending knee injury was big. Thomas Bryant, a 6-foot-10 center, is shooting an incredible 72.4 percent from the floor. McCaffery lauded the relentless motor of 6-7 Troy Williams, who averages 12.8 points. In other words, the Hoosiers will keep coming — and they can score in bunches, as shown last week with a 28-0 run at Michigan. They’ve won three Big Ten home games by at least 25 points. Iowa learned its lesson after getting beat 93-86 in a track meet two years ago in Bloomington. In last year’s trip, Iowa held Indiana to 30 fewer points. The Hawkeyes believe they can do it again, and keep the good times rolling. If they can, back-to-back games against two of the Big Ten’s worst teams — Minnesota and Penn State — await before a difficult finish against Wisconsin (home), Ohio State (road), Indiana (home) and Michigan (road). When, where: 8 p.m. CT, Assembly Hall, Bloomington, Ind. Game notes: Iowa''s Mike Gesell needs two points to reach 1,000 for his career. ... This is only Indiana's second game against a ranked opponent this year. The Hoosiers lost to then-No. 7 Duke, 94-74, on Dec 2 in the ACC/Big Ten challenge. Indiana next plays at Michigan State on Sunday. ... Iowa senior Adam Woodbury's 100 career assists are tied for the third-most nationally among active 7-footers.